Feijoa, which has the scientific name of Acca sellowiana, is a flowering plant that belongs to the myrtle family of Myrtaceae and is sometimes called pineapple guava. It is endemic to many regions of South America like southern Brazil, eastern Paraguay, northern Argentina, Colombia, and Uruguay. 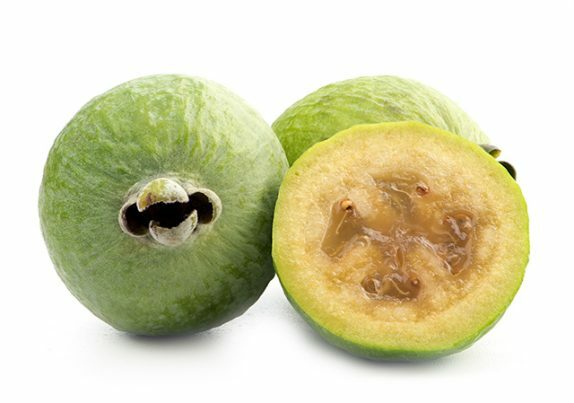 Nowadays, feijoa is also planted in Australia, Azerbaijan, western Georgia, New Zealand, and southern Russia. Its fruit looks like a green chicken egg, whose flesh tastes sweet and juicy like apple, mint, and pineapple. Its fruit pulp makes it look like a guava with a grainy texture. Feijoa seasons are different per area – for instance, in Brazil it is between late March and July, and in New Zealand it is between March and June. Feijoas are very low in calories – 100 grams of it only has 55 calories, so they are a good food choice for weight-watchers. The vitamin C that is present in feijoa acts as a water-soluble antioxidant which helps in allowing the body to develop resistance against infections and neutralizes cancer-causing elements in the body. One cup of feijoa contains 82 percent of the vitamin’s daily requirement. Manganese, which is essential in energy production processes in the body, is found in feijoa. One cup of feijoa is equivalent to 10 percent of the recommended daily intake of the mineral. One example of such processes is the energy production in the mitochondria. Folate, one of the B vitamins found in feijoa, lessens the risks of incurring Alzheimer’s disease and makes the brain less vulnerable to cognitive decline. Pyridoxine, on the other hand, prevents the body from feeling depression and nausea. Potassium stimulates blood flow to the brain to optimize cognition, concentration, and neural activity. Feijoa reduces the risk of hypertension due to its high potassium content (418 milligrams) and low sodium content (seven mg). As a vasodilator, potassium helps blood vessels relax, thereby allowing blood to flow more easily throughout the body. Feijoa is good for the digestive system. It has 16 grams of dietary fiber, which increases peristaltic motion and boosts secretion of gastric juices, which in turn aid the digestion process. It also prevents digestive issues like constipation and stave off the risks of more serious problems like colorectal cancer. The fiber that is present in feijoa is also responsible for reducing “bad” low-density lipoprotein (LDL) cholesterol and boosting “good” high-density lipoprotein (HDL) cholesterol levels in people who are afflicted with type-2 diabetes. Feijoa scores low on the glycemic index as it can readily be absorbed into the bloodstream, thereby preventing sugar crashes and cravings, and mood swings. Feijoa is good for the cardiovascular system. According to the National Health and Nutrition Examination Survey, individuals who had a 4,069 mg potassium intake per day are less likely to die from ischemic heart disease compared with those who consumed less amounts of potassium (1,000 mg) per day. Feijoa slices can be picked into salads. They can be used in confectioneries like cakes and muffins, blended into juice, or eaten out of hand. Feijoa can be eaten by anyone – regular men and women, pregnant and lactating mothers, children and infants, the elderly – for they have no known side effects. Feijoa is good for the digestive and cardiovascular systems. Feijoas are very low in calories so they are a good food choice for weight-watchers. Feijoa allows the body to develop resistance against infections.